I have to apologize – my Mani Monday post wasn’t uploaded first thing this morning. Between finals week, job interviews, and trying to pack my life away, the fact that I’m graduating in less than two weeks is bringing my life to a halt. But it’s also been the inspiration for this week’s Mani Monday! I usually get bummed out when I have do take off my funky nail polish for a job interview. I understand that I should look presentable, and hot pink crackle polish doesn’t always scream “Hire me!” But I do like to have fun with my nails. If you’ve read my other posts, you know by now it’s a slight obsession. This week, I tried to figure out how to combine classy and funky in a manicure that would be perfect to blog about, but also perfect to wear for an interview. The answer? 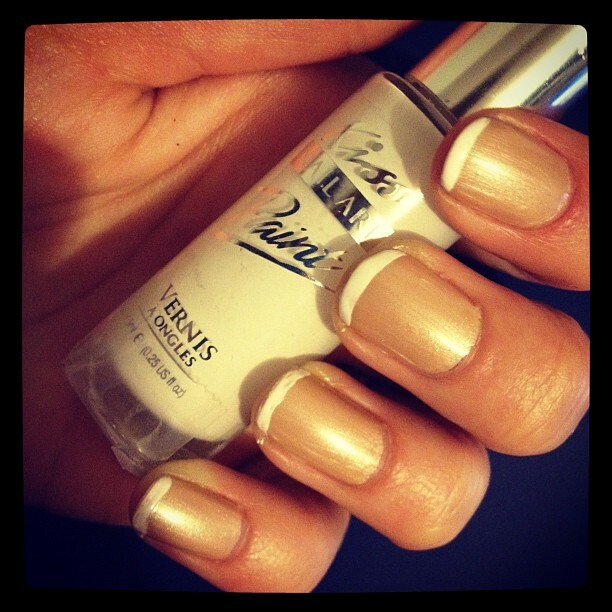 A French manicure … with a little twist. This mani is as easy as 1-2-3! White tip alla French manicure. I started off with OPI’s Sand in my Suit. I love this color because it’s a neutral without disappearing on my nails. It has a golden shimmer that’s slightly darker than my skin, but it somehow makes me look tanner than I am, even in the dead of winter. This is quite a bit darker than a normal French manicure base, but I’m throwing the rules out the window, right? Right. As I said before, usually the process for a French mani is base coat, white tip, second base coat. But since Sand in my Suit is dark, it covers the white tip and shows any flaws in it. So for this manicure, I did two coats of my base color first. 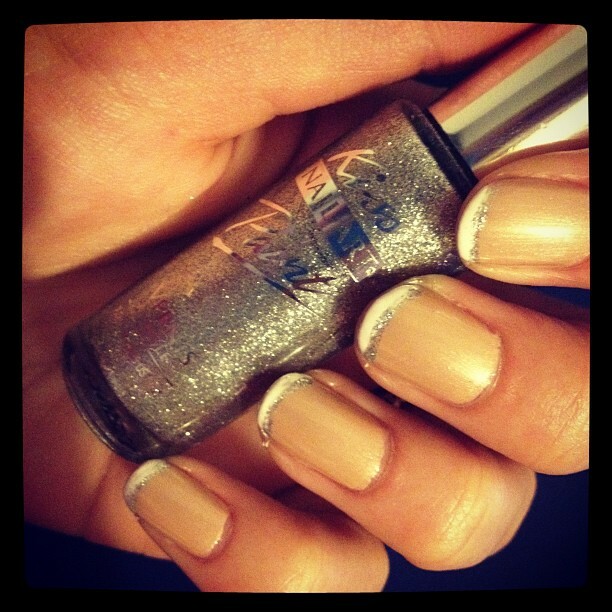 For the white tip, I love to use Kiss’s Nail Art Paint in White. You’ll find that I actually use these polishes quite often. They’re very versatile, even when I’m just using basic colors. Using them for something as precise as a French manicure might take some time, but I promise you it isn’t as hard as it looks. The brush is so tiny that as long as you take your time, you’ll get a good result. Another plus of using these (as opposed to French manicure sticker sets) is that you can make the white tip as thin or as thick as you’d like. I like to keep it pretty thin because I tend to think the thicker ones make my nails look fake. You could stop there – after all, there is nothing wrong with a basic French mani. I think it’s beautiful, elegant, and perfect for almost any occasion. I wanted to add another twist into this week’s French mani with some glitter! A single line of Kiss’s Nail Art Paint in Silver Glitter just above the white tip adds a whole new glam dimension to you look. Would you try this manicure out?